The planned balance of private and public urban outcomes at Auckland’s redeveloped Wynyard Quarter has won international recognition. Private investors have developed successful structures and businesses there, while visitors, residents and tenants alike enjoy a wide range of publicly developed and owned spaces, squares and amenities including playground areas for children and youth. These inclusive common areas are attractive and already well used by citizens from all parts of Auckland. The same cannot be said of Auckland’s Downtown waterfront where the existing commons is under threat of being sold for retail infill, encroached for private and exclusive uses, and congested by traffic particularly bus public transport. This is not a new phenomenon for Auckland’s waterfront central business district. Quay Park, Britomart, Downtown and Viaduct precincts are relatively recent developments mostly built upon land reclaimed from the seabed by Auckland Harbour Board which it later redeveloped and vacated when containerization rendered wharves largely obsolete. Over the past fifty years waterfront redevelopment plans have gradually rezoned CBD land that was previously used for port purposes into typically urban purposes by permitting office and retail development. Changes have always been contested by neighbouring property owners protecting private interests, and by Auckland City Council whose duties included provision of public infrastructure goods including transport and water infrastructure, and public commons including streets and public squares. Civic calculations of gains and losses have played a critical role in decisions about the balance that is needed between enabling private investment and economic growth, and providing sufficient public commons to meet the civic social and cultural needs of the city’s growing and diversifying population. One story about this planning activity is the Auckland Harbour Board’s sequence of headquarter buildings. Before 1970 Auckland Harbour staff were housed in an elegant three storey building at the corner of Quay and Little Queen Streets. Little Queen Street no longer exists having been “stopped” and swapped for Queen Elizabeth Square when Auckland Harbour Board redeveloped its Downtown site in the 1970’s to make room for the Air New Zealand Tower which it then occupied (now named the HSBC building). In the 1980’s, claiming that its lease was running out, Auckland Harbour Board applied to build a new headquarter building on Quay Street at the base of Princes Wharf. At the time Auckland City Council played a critical role in ensuring that open public space would be provided “contemporaneously” beneath the new futuristic looking building, and along parts of Quay Street. In the mid 1990’s Ports of Auckland Ltd (established from Auckland Harbour Board) sublet all office space in that new headquarter building, and, arguing that the associated waterfront spaces were unsuccessful and better used for retail and office purposes, obtained consents to completely infill to the wharf deck. Quay Street public space was lost, the Port company gained increased rents, and opportunities to redevelop that commons and make the public spaces along Quay Street and Princes Wharf more successful were also lost. Corruption might be too strong a word to describe what happened behind the scenes in this little bit of Auckland’s waterfront redevelopment history, but the urban politics relating to how public investment was allocated to produce something that looked like a common good but which eventually promoted gains in asset values for privileged property owners is an unhappy precedent. Proposals to sell the Queen Elizabeth Square commons and reinvest the proceeds in possible waterfront spaces along Quay Street are being challenged by a number of public interest associations (including Auckland Architecture Association, Urban Auckland, Auckland Civic Trust, Living Streets Aotearoa). While Auckland Council has for at least two years issued media releases and engaged in selective stakeholder engagement processes relating to these proposals and plans for the Central Rail Link which passes beneath the square, it was not until June this year that statutory submissions were sought. Submissions generally acknowledge that Queen Elizabeth Square is an unsuccessful, windy and shaded space, raise questions about the planning processes for the whole downtown area which includes a new tower and the relocation of the downtown bus terminal, and call for the provision of commensurate or better public space. Auckland’s waterfront is changing from being an industrial port to becoming a place that is attractive and interesting to the public and also to private investors. This is the story of urbanization around the world. The better the commons the more likely it is to be raided and appropriated by those seeking to make gains and to profit from it. Queen Elizabeth Square is 1800 square metres of prime commons estate within a city block which is being entirely redeveloped apart from two pre-existing towers. This urban commons was established by Auckland City Council when it built Little Queen Street. It is an urban space qualified and defined by surrounding buildings. Comprehensive redevelopment of the downtown site provides the opportunity to create a downtown square that is sunny, sheltered from the wind, and qualified by the buildings and uses that can surround it. Residents, office workers and visitors alike can use it. Precinct Properties owns much of the Downtown site and has a conditional arrangement with Auckland Council to purchase Queen Elizabeth Square for $27 million. Its property promotions for the currently proposed redevelopment show the main 'public' space to be created is a six metre wide glassed-in laneway lined with shops aimed at “premium and high-end apparel retailers” and “stores which will attract the cruise ship and tourist markets”. This would be another waterfront retail infill development. Streets are an important part of a city’s urban commons. Provided they are not congested with traffic. Streets and squares are the places where social and cultural exchange occurs within a city and where civic values of tolerance and understanding are fostered amongst a city’s people and its communities. Auckland needs more urban commons so that the possibility of an egalitarian population can be realised. These precious CBD spaces must not be handed over to become playgrounds dedicated for the use of “high net-worth individuals”. The redevelopment of the downtown block provides the excuse to properly incorporate the equivalent of Queen Elizabeth Square as a successful urban commons within the new built fabric of downtown Auckland. Just why are Hanoi’s houses so narrow? Like many oddities or inconveniences, one need look no further than government regulation. For centuries, governments in Hanoi used a method of determining property taxes based on the width of the property from the street. The wider your home, the more you paid. Not surprisingly, people responded by building houses so narrow that two people can barely stand next to each other in some of them. But it has led to interesting density outcomes, and little in the way of highrise. Here's a useful paper about Vietnamese housing and buildings combining shop and home. I've quoted from it in this post. If you're interested in recent Vietnam property tax and land ownership reforms - here's a good paper. There are two main things you'll probably notice about the architecture in Hanoi. Firstly there are the foreign influences, particularly from the French colonial period. This is especially apparent in the Old Quarter of Hanoi where people buy houses with very narrow frontages so that they minimise their tax burden while having a place to display their merchandise to passers by on the street. These buildings are sometimes referred to as "tube houses" - some run through from one street to the next - and often include courtyards partway through to improve air flow. Tube houses tend to be long and low - rather than tall and high. But the property tax outcomes are similar. DECREE No. 188/2004/ND-CP OF NOVEMBER 16, 2004: On methods of determining land prices and assorted-land price brackets. This reform is from the communist run central government. Note that Vietnam - like China - has adopted various market policies. Article 10.- Classification of urban areas, streets, land positions in urban centers of each specific land category for land price determination For urban residential land, non-agricultural production and/or business land and other non-agricultural land categories in urban centers such as land for construction of working offices, construction of non-business works; land used for defense or security purposes; land used for public purposes, including traffic land, irrigation land; land for construction of cultural, medical, education and training, physical training and sport facilities in service of public interests; land with historical and/or cultural relics, scenic places; land for construction of other public works as provided for by the Government; land used by religious establishments; land with works being communal houses, temples, shrines, small pagodas, worshipping halls, ancestral worship houses; land for cemeteries, graveyards and other non-agricultural land as provided for by the Government shall be graded according to types of urban centers, types of street and land positions for price determination. 1. Urban centers include cities, provincial capitals, district townships, set up and graded under decisions of competent state agencies. Urban centers are classified into 6 grades: special-grade urban centers, grade-I urban centers, grade-II urban centers, grade-III urban centers, grade-IV urban centers, grade-V urban centers according to the current regulations of the State. For provincial capitals, district townships not yet graded as urban centers, they shall be classified into grade-V urban centers. 2. Classification of urban streets Types of street in each grade of urban center shall be determined mainly on the basis of profit-generating capability, infrastructure conditions convenient for daily- life, production, business, service, tourist activities, on the distance to urban centers, trade, service and tourist centers. Streets in each type of urban center are classified into different grades of street with ordinal numbers from No. 1 on. Grade-I streets apply to land in the hearts of urban centers, trade, service and/or tourist centers; have the highest profit-generating capacity and the most convenient infrastructure conditions; the following street grades from grade 2 onwards shall apply to land not lying in the hearts of urban centers, trade, service and/or tourist centers, with lower profit-generating capability and less convenient infrastructure conditions. In cases where a street consists of various street sections with different profit-generating capabilities, different infrastructure conditions, such street sections shall be graded into the corresponding street grades. 3. Land positions in every street grade of each grade of urban center shall be determined on the basis of profit-generating capability, infrastructure conditions favorable for daily-life, production, business and/or service activities, on the distance to traffic axes. Land positions in each street grade of each urban center grade shall be classified into positions from No. 1 on. Position No. 1 shall apply to land adjacent to streets (with frontage) with the highest profit-generating capability, most convenient infrastructure conditions; the following positions from No. 2 onwards shall apply to land not adjacent to streets, with lower profit-generating capability and less convenient infrastructure conditions. A detour via a semantics study allows for a better understanding of the particular concept of the street within Vietnamese culture. The Vietnamese language provides a categorization of the world characterized by the use of classifiers for nouns, according to whether they are living things ( con ) or inanimate objects ( cái ). It is quite revealing that the common name for “street” is therefore “ con đ ườ ng ” and not “ cái đ ườ ng ”. The street is thought of in Vietnamese as an active being. The social practices contribute to define the street’s identity and they accompany its metamorphoses. There are many alleyways like this. They feel a little like designs you see in Dubai - keep the hot sun away from street level - and promote air movement. Though the alleyways of Hanoi and Ho Chi Minh Cities are places of trade, their functional organisation has a different nature.The alleyways are characterised by their lack of sidewalk, which does not prevent them from having a strong commercial use but requires a different spatial organisation. The households with small shops on the ground floor use the space in front of their houses to display goods or install tables and chairs if they own a coffee shop.Alleyways are most of all defined by the presence of hawkers or temporary market places that succeed each other throughout the day. Crossroads are considered the most strategic place to invest in, and every blind wall is considered a location to be freely used for trade. The alleyways’ urban space corresponds to what the urban sociologist Tôn Nữ Qu z nh Trân identifies as the “quiet city” as opposed to the “dynamic city” of major arteries (Qu z nh Trân, 2007). This distinction is mainly based upon the criterion of urban rhythm. This is a communal space shared by several houses off a common laneway in an old part of Hanoi. Interesting. These are streets where social encounters and exchange are the 'commons' that local people value, and which shapes and maintains social cohesion and organisation. Lose that, and you lose the heart of urban civilisation. These fishermen are trying their luck in a moat that surrounds the Imperial City at Hue, Vietnam. In June 1802 Nguyễn Ánh took control of Vietnam and proclaimed himself Emperor Gia Long. His rule was recognized by China in 1804. Building began in 1804. Which is very recent when you consider the history of Vietnam. The grounds of the Imperial City are protected by fortified ramparts 2.5 kilometers by 2.5 kilometers, and ringed by a moat. The water in the moat is routed from the Huong River (Perfume River) through a series of sluice gates. This enclosure is the Citadel (Kinh thành). Inside the Citadel is the Imperial City (Hoàng thành), with a perimeter wall some 2.5 kilometers in length. Within the Imperial City is the Purple Forbidden City (Tử cấm thành), a term similar to the Forbidden City in Beijing. Access to the innermost enclosure was restricted to the Nguyễn imperial family. The Imperial City at Hue is the best-preserved remnant of a vast citadel and royal quarters that once existed on the site. To put the ruins into context, it is important to consider how they were originally used. In the early 19th century the Emperor Gia Long consulted geomancers to find the best place to build a new palace and citadel. The geomancers chose the present site at Hue. The Emperor wished to recreate, in abbreviated form, a replica of the Forbidden City in Beijing. At his command, tens of thousands of labourers were conscripted to dig a ten kilometer moat and earthen walls to form the outer perimeter of the citidel. Later, the earthen walls were replaced by two-meter-thick stone walls built in the style of the French military architect Vauban. Due to the topography, the citadel faced east toward the Perfume river (unlike the Forbidden City in Beijing, which faced due south). The Emperor decided to locate his own palace within the walls of the citadel along the east side nearest the river. A second, smaller set of walls and moat defined the area of the "Purple Forbidden City," where the Emperor built a network of palaces, gates, and courtyards that served as his home and the administrative core of the Empire. By the time the last Emperor of Vietnam stepped down in the mid 20th century, the Purple Forbidden City had acquired many dozens of pavilions and hundreds of rooms. Although improperly maintained (the city suffered from frequent termite and typhoon damage) it nevertheless remained an imposing spectacle. All of that changed in 1968, during the Tet offensive, when American military forces in Vietnam, reacting to the communist takeover of Hue, ordered the city retaken. American bombs blasted the majority of the city into rubble, sparing only a handful of buildings. Nowadays the city has been declared a UNESCO site and some of the remaining buildings have been lovingly restored. But, much of the site was so badly damaged that it has been given over to rice fields that cover most of the Purple Forbidden City. Even so, the remaining buildings are sufficient to give the visitor a sense of how the Vietnamese interpreted Chinese imperial architecture and adapted it to their culture. The outside of the main entry building. No photographs permitted inside. Mostly Vietnamese tourists or visitors. I met one - now living in Canada. It was his first visit to Vietnam since being one of the boat people who escaped Southern Vietnam - fearing communism - in 1978. He was born in Hanoi in 1950. Then when Vietnam was divided into North and South his family opted not to be in communist run North Vietnam, and shifted to Saigon. Which - in 1976 - came under communist rule. Reunification. David was one of the many who fled to Thailand as a refugees. The place has soul and is very well interpreted. An education. We learned about the mandarins. Anyone at any Vietnamese school could become a mandarin. Selection was based on merit. Pass the exams and you're a mandarin, advising the emperor who was born to rule. This is model of the Imperial City before it was bombed. The model is just over a metre square. Probably best to click on it to get an idea. Interpretation signs suggest that Confucian ideas about space and separation had a major influence on layout and design. In the early morning hours of January 31, 1968, as part of the Tet Offensive a Division-sized force of North Vietnamese Army and Viet Cong soldiers launched a coordinated attack on Huế seizing most of the city. During the initial phases of the Battle of Hue, due to Huế's religious and cultural status, Allied forces were ordered not to bomb or shell the city, for fear of destroying the historic structures; but as casualties mounted in house-to-house fighting these restrictions were progressively lifted and the fighting caused substantial damage to the Imperial City. Out of 160 buildings only 10 major sites remain because of the battle, such as the Thái Hòa and Cần Thanh temples, Thế Miếu, and Hiển Lâm Các. So there you go. 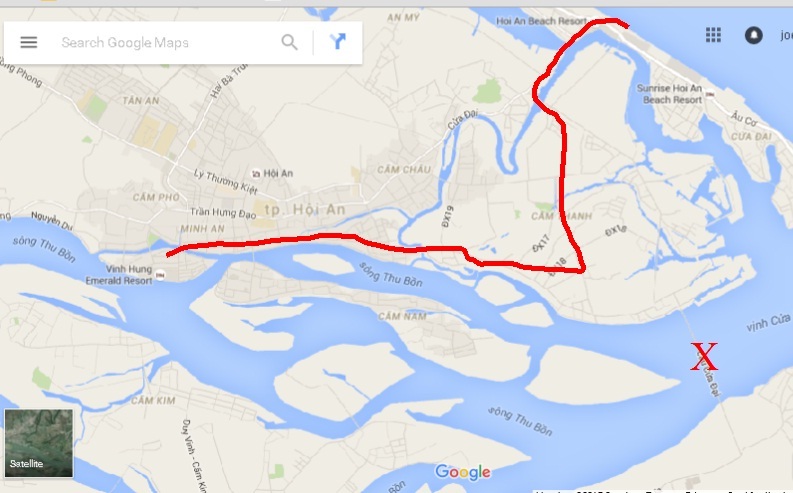 The strength of the Nguyen line caused the capital of Vietnam to shift from Hanoi to Hue in the early 1800's. This situation continued until the mid 1945 when the then emperor abdicated and handed control to Ho Chi Minh (roughly translated means: 'bringer of light')who became president of North Vietnam. It appears prior to that there was a crisis in succession. The heir was 8 years old. The French - who had colonised Vietnam a century before, but were then pushed out - seized the moment to return and establish a puppet government. The sort of colonial rule that Ho Chi Minh and his supporters could not abide. Go there. 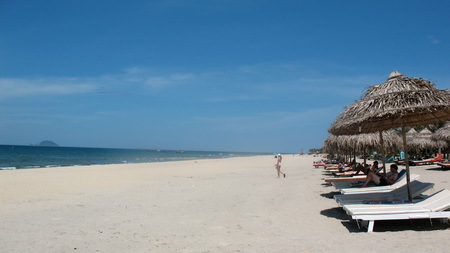 Hue is one of Vietnam's main tourist attractions. 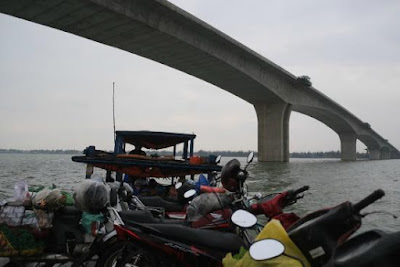 It is on the Perfume River (Hương River) a slow moving river which is not much above sea level for about 30 kms inshore. It shares similar characteristics to the Mekong River with its delta of sand dunes layered with fertile sediment. I bought a couple of interesting books while I was in Hanoi. One was a collection of academic papers collected at a UNESCO run symposium about Hue which is another world heritage urban site in Vietnam. One of the papers was about the city's geomorphology. It explored what had happened to the sea level over the past 4000 years. Turns out that Vietnam's leaders shared the same concerns as China's leaders did about the effect of traders on the attitude of local population. Which is why those leaders preferred and supported trading centres away from cities like Hanoi and Saigon. Hundreds of years ago when Hue was one of the most successful trading ports in South-East Asia it contained a Japanese city and a Chinese city. There were some Vietnamese locals, but the key Vietnamese role was to tax ships and their loads when they visited the Port. Fishing was important to the locals as was rice growing, pepper, nutmeg and silk (Chinese nobles preferred Vietnamese silk to local silk). But the real economic purpose of the port at Hue was the collection of taxes shipping and goods that were imported or exported. It appears this all changed very quickly about 200 years ago when something happened to the sea level and the navigability of the river and inshore water areas. The reasons for this are not particularly clear. What the paper says is that the sea rose by 3 to 4 metres, and because the sand flats which the city was built on were themselves only a few metres above sea level - they got flooded. The paper also reports that the bar, where the river entered the sea, closed off, so that sand washed downstream could not be cleared and so the harbour silted up. The upshot was that the harbour quite quickly became useless as a trading port. Trade shifted elsewhere. But the city and its buildings remained pretty much untouched. 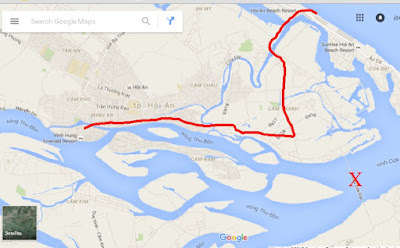 This map shows a bike trip we made from our hotel on that island (in the heart of Hue), to the coastal resort and its beaches. The route we took went through rice fields and small villages on cyclepaths, rather than along the main road (which turned out to be quite quiet - when we took it back). 'X' marks the spot of a very large bridge. Here's the bridge. I guess it's 2 or 3 kms long, and must rise more than 100 metres above sea level. It's vast. Hardly carries any traffic. Part of a Vietnam growth plan. We biked up it by mistake. Hot work that was. Here's the view from the top - looking towards the coastal area you can see in the map - where the beaches are. The floating blobs are clumps of lilies that come and out with the tide (think the tidal movement was about 2 metres). This is a telephoto shot from the same point. And here we are at the beach. Beautiful white sand and coconut palms. Idyllic - and we could buy something to drink. We call it the Vietnam War. They call it the American War. This is the WAR REMNANTS MUSEUM in Saigon, now named Ho Chi Minh city. According to TripAdvisor this is the top tourist destination in Ho Chi Minh city. Deservedly. Hard to do it justice with a few pics, but I'll give it a go. You're told to start at the top floor. An exhibition there is entitled: "Home Truths". One on the second floor is entitled: "Agent Orange". Little has been spared. The story starts with the text from a 1945 Ho Chi Minh speech: "Vietnam has the right to enjoy freedom and independence and has really become a free and independent country. The entire Vietnamese people are determined to mobilise all their physical and mental strength, to sacrifice their lives and property to safeguard their liberty and independence..."
Caption reads: "Painted signs designed to instill aggressive spirit. At Foort Polks AIT Center (Louisiana)..."
The exhibition quotes original words and lets these tell the story. American Senator Wayne Morse, Sept 23, 1965, most likely after the USA got involved after the Gulf of Tonkin incident (pretext rather like: "Iran has weapons of mass destruction...."). This table shows the extent of the role of New Zealand (satellite country) between 1964 and 1972. Wonderfully smug portrait of President Nixon. Text suggests Americans considered Vietnam, Laos and Cambodia as pretty much the same. Famous shot. Independence Palace is now called Reunification Palace. Great place to visit too. Said to be excellent example of 1960's architecture. Famous images are on display. This interpretation image describes the purpose and origins of this part of the Remnants Museum. Caption: "Twins were born in 25th February at Sa Thay where was agent orange heavily sprayed area, west of Kon Tum, central highland in central Vietnam (Tu Du hospital, 1984). Picture on left is marine holding up part of someone who has been hit with a rocket propelled grenade. Right hand pic is of two prisoners being dragged to death. A lot of information is provided explaining that USA strategy was to be cruel, to scare/terrify Vietnam into submission. Which brings us the agent orange display and exhibition. With gas masks. How useful were those I wonder? The message reads: "Come to the victims of agent orange, the poorest of the poor, the most suffering of those who suffer!" And it goes on. A sobering exhibition. Makes you think and reflect. All the more compelling when you've been on the street, drinking and eating with the people. So much laughing and smiling.